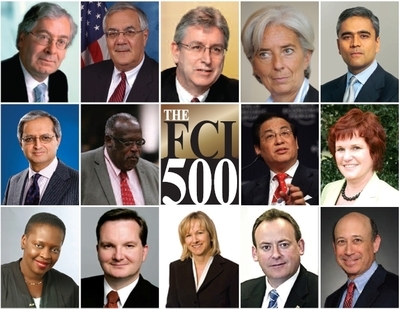 This inaugural‘FCI 500’(published August 5th 2010) is not just another list of influential people. It is intended as a first insight into the people the forces, and the institutions that are behind the unprecedented re-shaping of the global financial system, following the credit crisis which began in 2007. The list appears in the following ten pages, with each entry linking in turn to individual pages for each nominee, each of which provides an insight into the particular reasons for their inclusion in the list. (The full FCI 500 list is available here and also here. One of the insights underlying the FCI 500 is that financial services remains a network business in which global institutions, be they public or private, exist to serve national markets operating through a network of independent jurisdictions. This is despite the unprecedented globalisation of finance, marked by the rush to arm global and supranational institutions with new powers and authority. To paraphrase a former Speaker of the US House of Representatives who said 'all politics is local', finance is ultimately local too. This is just one of the many perspectives that emerges from the FCI 500. The list is intended to underscore other realities as well, several of which are referred to in our methodology, below, which involved several stages and processes. Finance has been globalising rapidly in the past 20 years, partly though technology, and culturally, as key concepts are shared on a more widespread basis across the world, with the Middle East, the BRICs, and Asia currently riding a wave of growth in finance as the traditional centres of finance in Europe and in the common law ‘Anglosphere’ jurisdictions recover from the hangover of the credit crisis that began in their countries. This globalisation was propelled, for example, by the interconnection of local property markets through the origination and distribution of credit derivatives, (with the blessing and sanction, throughout the process, of legislators and regulators). Now, efforts to apply the lessons of the crisis are resulting in a concentration of efforts, and perhaps powers at supranational levels, and this process has influenced the choices of those at the top of the list. Thus, the top names in the FCI 500 reflects the position of those with global mandates, such as Mario Draghi, and the managing director of the IMF, as well as the biggest players in multinational financial services companies. This is not, though, a list of the most influential people in world finance, it is a list of the most influential in financial centres. The point is that, in the end finance is a network business operating through a network of independent jurisdictions. The 'FCI500', then is intended to recognise the key players in jurisdictions across the globe, and the key sectors and activities making up that list. The list took almost two years to compile. It thus reflects the travails of the world financial centres during that time of change. It also, as a result, reflects, indeed, the staying power of many of its members. The process of compiling the FCI 500 consisted of three stages. The first stage was an initial list compiled by the editorial board of FCI expanding and refining the original list. This resulted in a list of 500 names, which then was modified by the final stage, of seeking nominations from the panel of voters who vote on the panel of the GFCI, Z Yen's bi-annual ranking of global financial centres, formerly published by the City of London Corporation. The voting took place in June 2010, and the GFCI Panel nominated over 1,000 individuals. Many of these were in the original list and the nominations were used to widen the list and influence the rankings. It was to reflect the lengthy time frame of the project itself providing a perspective on the changing forces of influence in the past two years, underlining both the permanance of certain individuals, institutions, standards and values, as well as the transitory status of others. The list excludes most major politicians, but does include certain others. The criterion for inclusion of a politician was that they have a particular financial sector interest, expertise, influence, or, most importantly, achievement. On this basis, to give an example, US President Obama is excluded, even though he might be regarded as the most powerful politician in the world, and, indeed, is certainly influential in financial services (even to the degree of personally highlighting in a press conference his awareness of law firm Maples & Calders' offices in Ugland House in Cayman Islands, and providing impetus for the Dodd-Frank legislation, as the leader of the Democratic Party). The transitory nature of influence for politicians is of course a fact of life, as, for example Lord (Paul) Myners would know. Nevertheless Lord Myners does make the list, as he has signalled that he will continue to make meaningful contributions to the financial services debate from the UK Opposition benches – for example through his critique of the proposed UK bank levy. In setting the methodology sectoral weightings were assigned for financial sectors, reflecting geography, and the balance between public and private – i.e. between the ‘for profit’ industry itself, the politicians, whose role it is to create the 'road network' that finance needs to be able to travel on to oil the wheels of industry and commerce, and the regulators whose role is to oversee, and indeed enforce the ‘traffic laws’ on that road network. Inevitably, as a result of the credit crunch we were surveying a sector in absolute crisis as the project began, and that influenced the makeup of the FCI 500 Panel. Both the 'Structural Criteria' followed and the 'Personal Criteria' were influenced by this. (a) While the motnodology strongly reflects the principle that the head of a company should devote all of his or her energy to the pursuit of the welfare of that company and 'stakeholders', the boss who is able to combine corporate involvement with a wider role, as for example shown by such as Deutsche Bank (and the IIF's) Josef Ackermann, does gain increased weighting in the list. (b) at the same time, the weightings sought to recognise those who are motivated by a public purpose in their national centres; these would include, for example, public sector position holders such as BVI's iconic regulator Robert Mathavious, who at a key time stood aside from his role of regulator to help develop BVI's attractions as a financial centre, and indeed on a wider international level as well, and a number of finance ministers whose influence in the past year has been evident as well, examples being Singapore’s Tharman Shanmugarathnam and Canada’s Jim Flaherty. (c) the weightings also sought to recognise influence as the ability to get it right, and being able to dispense sound advice at a time it is badly needed. Listed for this reason is the former head of markets in the SEC, and now academic, Eric Sirri, and former SEC regulator, who told the US House of Congress Financial Crisis Commission in May 2010 that stress tests are not just about liquidity ratios, or mechanistic spreadsheet operations to crunch numbers supplied by banks, but about the quality of the underlying assets, a much more qualitative thing, a more difficult thing for regulators to get their head around, but nevertheless still critically important. The FCI 500 also provides a high weighting to the Canadian banks, who famously got it right in the crisis, and not just because they were ‘boring and unadventurous’, as they themselves have sometimes described their stance. They bought derivatives and credit linked derivatives along with the best of them, but they did have the foresight, driven by prudential judgements, to get out of them before some of their southern counterparts. There are some members of the FCI 500 too, whom, in the opinion of the nominating panel are not 'getting it right'. Nevertheless, they do wield influence, and because they are listened to widely, and believed, and are therefore influential, have earned their position in this list. Examples are Paul Krugman (against G20's call to rein in public spending), not something our panel, or indeed the FCI 500 would agree with (see last month's FCI) or, for example, Richard Murphy of the UK- based Tax Justice Network, which has identified tax ‘avoidance’ through arbitraging different tax levels in different jurisdictions as unacceptable. In this first 'FCI 500' regulators, politicians, and lobbyists, as well as 'thought leaders' made up a higher weighting than the panel felt was healthy from a long term perspective. The hope is that over time that proportion will diminish, as leadership in financial centers shifts back towards the industry itself. As it is, that proportion approaches half, and, over time, it is probable that the proportion will decline to something more like 40 per cent or less, and perhaps even significantly less. The private sector: 60 p.c.. These include representatives from the major banks of the world, asset managers, including (sovereign) wealth and hedge funds, pension funds and insurance companies, corporate finance, service provision, for example global custody and prime broking, and investment banking. 'Markets infrastructure' was another major thread in the private sector infrastructure, including exchanges, whose role in financial centres is particularly significant. Because of their important role as front office 'window displays' for their particular financial centres, the importance of exchanges is underlined in the FCI 500. Standing alongside the private secor are the service providers. These also exert a key influence, notably lawyers, auditors, tax advisers, and consultants. Lawyers, as the bearers of legal knowledge occupy an unique position of influence and interpretation in their specialist jurisdictions. In their jurisdictions they are the experts on what can be possible to facilitate international financial services, and their ingenuity (in the best meaning of the word) as advisers to their own governments, and clients has been the critical spark for the growth of many successful financial centres. Lawyers and tax advisers have of course sometimes been the targets of accusations of participating in a game of innovation and regulatory arbitrage against clumsy, slower, and less well funded public regulators, but while there may be some truth in this narrative, there is much that is self serving in it too - serving 'clumsy' regulators who were caught sleeping on the job, and who are now seeling overpowering powers of over- regulation. The reshaping of regulation has still a considerable distance to run. However there are beginning to be chinks of light, as signs of progress to the next stage emerge, for example, as indicated in the position of the FCI of people such as Stefan Walter of the BIS, and the Korean G20 sherpas. An example of this is the decision of the UK Government to strongly capitalise those of its leading banks which fell foul of the credit crunch (with taxpayers’ money), a fact underlined in Europe's bank stress tests and welcomed by our No. 1 list member, Mario Draghi. This reflected a wise anticipation of the direction the regulatory cycle was going to turn (towards strong and robust capitalisation), and the anticipated moves were made, and already are being capitalised upon. The United States too learnt the lessons early and prompt action has seen a recovery, hence for example, Goldman's Lloyd Blankfein's position in our FCI 500, as well as the arrival of Vikram Pandit, whose Citibank has lately surprised at the speed of its recovery, a positive sign of the passing of the crisis, and prompting his nomination in our top 20.